On November 27 the National Library of New Zealand became the sixteenth institution to join The Commons. 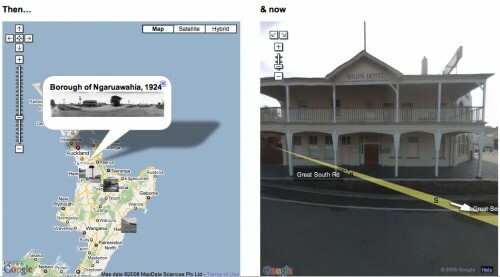 In what was perfect timing, within days Google launched their streetview service for New Zealand. Of course I’ve modified my then and now mashup to include the images on Flickr from the National Library of New Zealand. 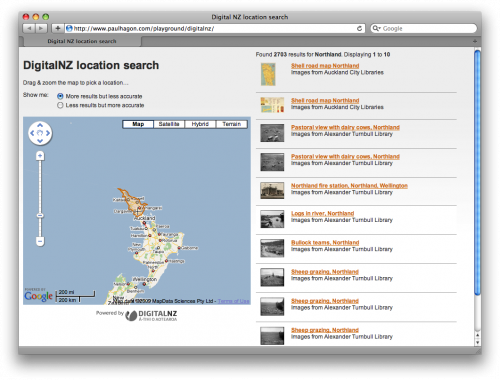 They’ve been busy geotagging their images and it’s all starting to come together and providing some interesting looks into how New Zealand has changed over time. Start exploring New Zealand then and now. 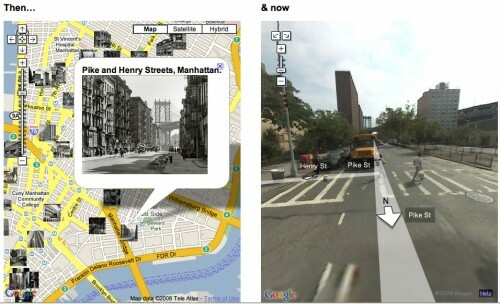 Following on from my previous then and now Flickr commons meets streetview demonstration, I started to think of how could I bring that experience to a user based upon their current location – take out the streetview and replace it with a real life view. Can you provide an immersive experience for a user, giving them only the historical items from a cultural institutions collection, that are relevant to their current location? Imagine being in a location with your laptop or mobile phone, and being able to see exactly what the location you are standing in looked like in the past. For example – thanks to free wifi from the Apple Store in Sydney on George Street, I built a web application to show me my current location. It’s pretty accurate, but not perfect. 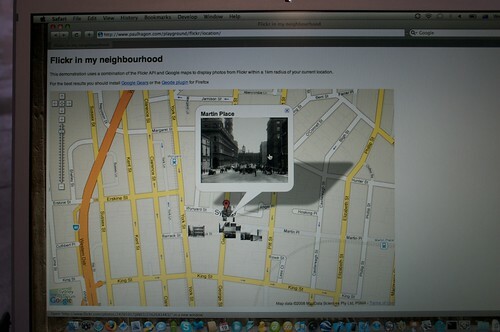 In this case it’s showing my location as about 100m from where I actually am (on the corner of King St and George St). I can then display all the images from Flickr Commons that relate to that area. 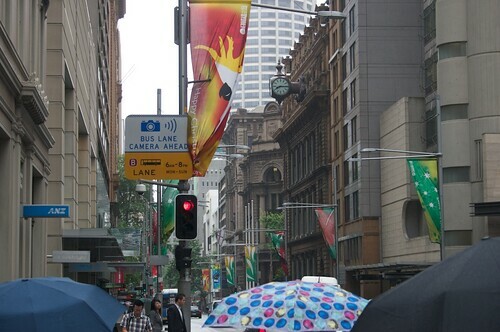 As you can see there are a variety of historic images available and I’ve selected an image showing Martin Place. From where I am standing on George Street I can see the real life buildings that are shown in the historic photo. 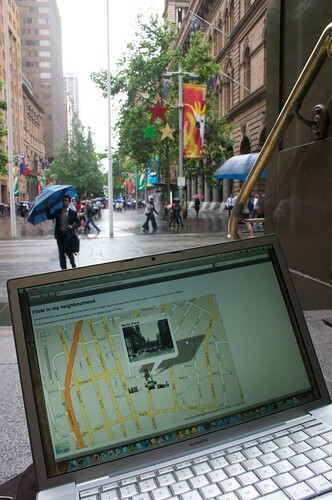 If I then walk down George Street 100 metres I can be in the same environment where the photos were taken and can compare the historic image of my current location on my laptop to the environment I am standing in. Up until a few months ago, the only option available was to to guess the location of the user based upon their IP address. This might have been able to give the application the city that a user was in, but it was unlikely to provide it with a more accurate location than that. Recently two plugins based around the W3C Geolocation specification have been developed – Geode from Mozilla labs for Firefox 3 and geolocation functions have been added to Google Gears which is available for a variety of browsers. By using these plugins I can determine a reasonably accurate latitude and longitude for a users location and if a user doesn’t have either of these plugins installed, or for privacy reasons decides not to allow these to broadcast their locations, I can fall back to using the much less accurate IP address lookup. Once I have a users location, I can use the Flickr API to return all the images that are within a certain radius of the user. If I also use Google Maps as the mapping application, I can also add wikipedia articles from the users current location into the mix. I’ve developed two prototypes, the first one returns historical images from Flickr Commons. Given that there aren’t a vast number of photos in the Commons yet, and even fewer have geolocation information added, unless you are around the Sydney CBD area, your mileage may vary. The second prototype returns images from Flickr that have a creative commons license. As there are a lot more images available in this category, the chances of getting a result is much greater. For either of these to work you’ll need to download one of the plugins.